All you need for your Quaker Parakeet in one place. Food, treats, toys, cages, accessories & supplements. We stock everything you need for your Quaker Parakeet. Shop for healthy food, delicious treats, spacious cages, natural perches, interactive & foraging toys, accessories and supplements. All highly recommended and made with Monk Parakeet in mind. All orders are Shipped Fast! Free Delivery on Orders over £39! Keeping your Quaker Parrots healthy and happy has never been easier with Parrot Essentials wide range of top quality diets, entertaining toys, and comfortable cages. As a bird owner, you’re aware of the importance of feeding your Quaker Parrot a highly nutritious diet. When your bird is fed properly, you can expect many benefits like brighter plumage and a longer life expectancy! We can fill your feathered friend’s tummy with our delicious variety of foods. Each pack contains natural ingredients made with filling and palatable mixes of seeds, fruits and nuts that are great for any time of the day, and other high-quality ingredients. Choose from foods like complete and pelleted foods, seed blends, and more! Not only do we offer amazing food choices, but a wide array of treats! Do you want to spoil your bird with treats? We can help! Are you looking for treats to reward your Quaker for good behaviour? We have them! 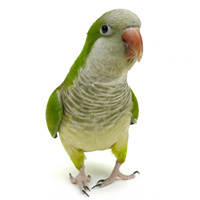 Rest easy knowing at Parrot Essentials, we have many treat flavours and choices for your feathered friend! Is your Quaker a pesky eater? Supplement or power up your pet with our wide variety of health supplements made just for your Quaker’s daily nutritional needs. Our supplements are formulated with the essential vitamins and minerals that promote natural and healthy processes in your bird. Paired with our extra delicious treats and foods, your Quaker is on their way to one healthy and happy bird. Give your Quaker the best home with Parrot Essentials’ beautifully crafted bird cages. Our cages are made from durable materials and feature individual designs to accommodate accessories you may want to add to your bird’s cage. Our selection varies from in home cages to traveling cages. Explore your options with us and find the best match for both you and your winged friend today. When giving your Quaker “out of cage” time, providing them with a Parrot stand is a great way to ensure your bird’s safety and adequate exercise away from their cage. Using stands around your home means your Parrot can be with you no matter where you are or what you are doing! Browse our fun-tastic toys like interactive puzzle boards, colourful candy vines, and more. Your Quaker is in for a mentally stimulating day when you interact with them and use our toys. Each toy is made from bird friendly materials which help promote natural foraging behaviour among them. Just when you thought you had everything for your bird, we are here to remind you to take a look at all of our accessories! Accessorizing your pet has never been this easy with our wide collection of accessories that fit your Quaker’s needs and wants. We offer things like; cage perches, cage cleaning supplies, and no-mess bird feeders.